A new Tangerine Dream box set is to be released later this year by Universal Music. It’s titled In Search Of Hades: The Virgin Recordings 1973-1979 and will feature seven remastered albums: Phaedra, Rubycon, Ricochet, Stratosfear, Encore, Cyclone and Force Majeure. The remasters have been taken from the original first generation master tapes, while the box set will also include eight CDs of previously unreleased material. The Zest report there will be three full London concerts: Victoria Palace Theatre (1974), The Rainbow Theatre (1974) and Royal Albert Hall (1975). The full previously unreleased 1974 soundtrack Oedipus Tyrannus will also be included and it’s been remixed in 5.1 Surround Sound and Stereo by Steven Wilson. 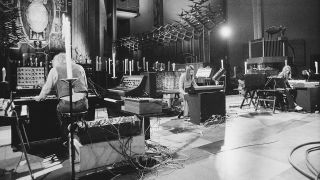 In Search Of Hades will also feature previously unreleased material from the Phaedra sessions and live material from Coventry Cathedral in 1975. Two Blu-rays with 5.1 mixes of Phaedra, Oedipus Tyrannus and Ricochet, will also be in the package, along with clips of the band from German TV in 1978, and footage from Coventry Cathedral, which was originally shown on the BBC’s Old Grey Whistle Test. A full tracklist will be revealed in due course, but the cover art can be seen below.